Awesome, the scan was quick and fixed PC in no time! After I ran PC Booster the first time, it felt like my PC had a new lease of life! Are your IT Support costs ballooning? Slow up suddenly and RESTART unexpectedly? Is your IT support desk stretched to the limit? Worse still is your business still running when your computers are down? Computers slow as they age. They accumulate all sorts of clutter, downloads and errors from repeated use. This puts strain on the IT helpdesk, as more and more end users call up to troubleshoot PC problems and ask for upgrades or even new computers. Slow computers can frustrate your employees, reduce productivity and lower morale, as well as increase IT support costs. This can affect your bottom line and increase the total cost of ownership of desktop and mobile computer fleet. By taking a pro-active approach to desktop management with PC Booster, companies can extend the life of their PCs and reduce capital expenditure. 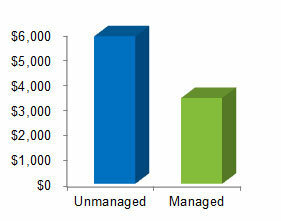 According to Gartner, a well-managed computer can save up to 42% compared to unmanaged PC. Extend PC life by up to 2 years and reduce capital expenditure. Create a more positive user experience by eliminating PC issues. Provide relief and reduce IT Support costs for computers that have fewer problems.